This is an oil painting of a steam ship called 'SS Shieldhall'. It is painted in oils on a 16" x 20" canvas. She was launched 7th July 1955 and was built by Lobnitz & Co of Renfrew, UK. The ship was withdrawn from service during 1985 and entered preservation. It is the largest working steam ship in Europe. 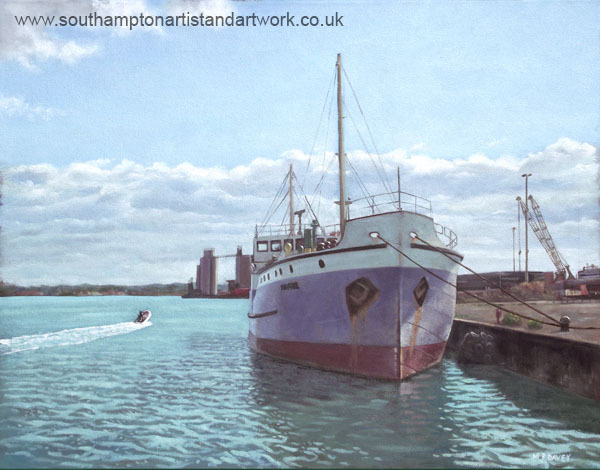 It is part of the National Historic Fleet and is based at Southampton docks, where it is moored in this painting. The view is looking south, toward the Solent. The little dingy was added to give the ship scale. The grain silos are a land mark at Southampton docks and can be seen in the background, and are to be seen in some of my other paintings. The colour and reflections of the water were fun to paint, although quite difficult. Painted in 2010.